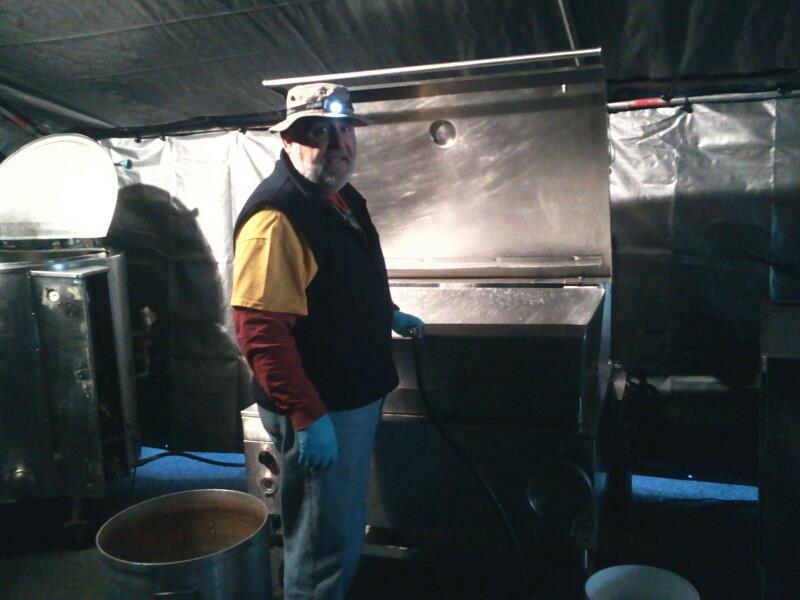 Kentucky Baptist Disaster Relief volunteer Glenn Hickey serving with feeding unit in New York City. In the book of Isaiah, God tells the remnant of His people living in a difficult time to “Enlarge the place of your tent” (Isaiah 54:2-3). I love the imagery of a tent. Tents speak of flexibility, adaptability, and mobility. You can set up a tent almost anywhere. A tent can easily be expanded by adding panels. A tent is easily packed up and transported wherever it needs to go. This sounds a great deal like Disaster Relief ministry – flexible, adaptable, and mobile. The response to help those affected by Hurricane Sandy has been challenging as we have faced logistical challenges, resource shortages, and extreme weather conditions. Through it all, our volunteers have demonstrated the ability to be flexible, adaptable, and mobile for the sake of Christ. These faithful Kentucky Baptist Disaster Relief volunteers have provided thousands of meals, cleared trees, and pumped flooded basements. But, more importantly, they have shared the hope of Christ through the work of chaplains, prayed with those affected, and offered the life-changing Good News of our Savior. “We’ve faced some tremendous challenges, but we are still serving people despite it all,” said Karen Smith, a Southern Baptist Disaster Relief leader serving with her Kentucky feeding kitchen at Aqueduct Racetrack in South Ozone Park, N.Y.
Last Sunday, Southern Baptist Disaster Relief feeding units and volunteers provided almost 100,000 meals in New York and New Jersey to people devastated by this mega-storm that slammed the Northeast. As these meals and other ministries have been provided, it has opened doors to share the hope of Christ. The result is that at least four have made professions of faith during the response. Flexibility…Adaptability… Mobility… Kentucky Baptist Disaster Relief remains ready to go wherever and whenever the Lord needs someone to go into the broken places. Kentucky Baptist Disaster Relief is currently responding to those affected by Hurricane Sandy in New York City. Contributions for the response to Hurricane Sandy and other disaster responses can be made online or by mail to “Kentucky Baptist Disaster Relief” in care of the Kentucky Baptist Convention, PO Box 43433, Louisville, KY 40253-0433. Kentucky Baptist Disaster Relief is a ministry supported through gifts to the Cooperative Program and the Eliza Broadus Offering for State Missions.